Gov. Rick Perry’s office pushed back Tuesday against criticism that he overreached in funding the deployment of Texas National Guard troops to the border. A representative from Gov. 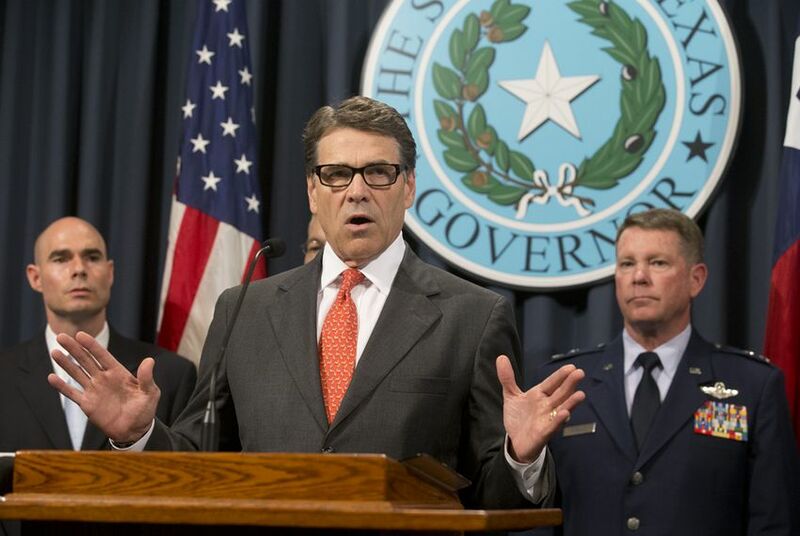 Rick Perry’s office pushed back Tuesday against criticism that the governor overreached in funding the deployment of Texas National Guard troops to the U.S.-Mexico border, saying the governor made the best choice possible in an emergency situation. The comments by Mike Morrissey, the governor's deputy chief of staff and senior adviser, came at a Legislative Budget Board meeting. Morrissey said the governor, facing a situation along the border that had risen to an emergency level, had three ways to fund the National Guard deployment: using the emergency rider, tapping into the governor’s disaster funds or utilizing the traditional "budget execution" authority of the board to find sources of money. Perry chose to use the rider, Morrissey said, because he was concerned that the budget execution option would take too long and Perry didn’t want to deplete the disaster fund in the midst of hurricane season. The result: Perry redirected $38 million in unused Department of Public Safety funding for emergency radio communications to go toward the National Guard. The South Texas border has drawn heavy attention in recent months as more than 57,000 unaccompanied children — mainly from Honduras, El Salvador and Guatemala — have crossed the U.S. border, mostly into Texas. Morrissey also said "this is the first time that I know of" that Perry has used a little-known budget rider to appropriate funds without going through the Legislature. On Monday, Perry's move had drawn scrutiny from several lawmakers, with a spokesman for House Speaker Joe Straus, R-San Antonio, telling the Tribune that using the disaster funds would have offered "a more transparent approach." Perry laid out his rationale for classifying the border crisis as an emergency in a July 29 letter to the comptroller’s office, Morrissey said, noting that the governor had asked the federal government for assistance for years. The comptroller’s office then worked to find the $38 million in the DPS emergency communications purse, said Martin Hubert, deputy comptroller. That decision, and the process employed to reach it, drew some criticism from representatives and senators on the Legislative Budget Board, which moves funds among state agencies between the Legislature’s biennial sessions. And state Sen. Juan “Chuy” Hinojosa, D-McAllen, said he agreed with the choice to save disaster funding for potential hurricanes and other crises. The border security efforts were also discussed at a Texas House Committee on Homeland Security and Public Safety hearing Tuesday morning. Committee members asked Adjutant General John Nichols, head of the Texas National Guard, to define the scope of the organization's mission. “My command to my folks is, avoid confrontation,” he said. “Our rules of engagement are really rules of nonengagement.” If undocumented immigrants try to turn themselves in to National Guard troops, he added, the soldiers are instructed to ask them to sit down and wait for Border Patrol or DPS agents to arrive. DPS Director Steve McCraw said at the committee hearing that the past month's border security efforts are working at combating what he described as a drug cartel-driven immigration influx. During the first week, he said, there were 6,606 migrant arrests; last week there were 2,974. McCraw said that’s proof that “saturation patrols” in immigration hot spots in the Rio Grande Valley are deterring immigrants — including cartel members, criminals and terrorists, he said — from trying to enter the country illegally. At the LBB hearing, Morrissey’s responses shed more light on the details of Perry’s appropriation. Of the $38 million, $7 million is slated for DPS to pay for the costs of its border operations this summer. The remaining $31 million will fund the National Guard deployment, though it will probably last just two and a half to three months. And not all of the money currently exists: The account has about $33.7 million at the moment, with about $5 million estimated to come in via receipts by December. Beyond the roughly three months of funding for the National Guard, Morrissey said, the governor’s office wants to work with legislators to use budget execution to find additional sources of funding for an extended deployment. The office is in the process of identifying a few hundred million dollars elsewhere in the budget, and tapping into those for the future. Morrissey said the governor’s office would also be open to using budget execution to repay the radio infrastructure account from which the recent funding was drawn. Turner emphasized that the government would need some metric for determining when the border crisis was no longer an emergency, given that its beginning was not a finite event — like a natural disaster — but rather an escalation of long-standing problems. “Otherwise, how do we know when we have achieved our purpose?” he said. Morrissey responded that Perry would be happy to work with legislators to devise such a measure. Hinojosa asked if some of the $38 million could be directed to local communities to defray their recent costs of housing and caring for many undocumented immigrants and children. Morrissey said that the funding was statutorily restricted to public safety ends, and that the question of whether reimbursing local communities falls under that rubric could be discussed. State Sen. Jane Nelson, R-Flower Mound, noted that the Senate Finance Committee, of which she was recently named chairwoman, will delve more deeply into the issue at its meeting next week. Correction: A previous version of this story said that more than 57,000 undocumented immigrants have crossed the U.S. border in recent months. The story should have said that more than 57,000 unaccompanied children have crossed the U.S. border in recent months.